It’s 10:30 at night and you’re letting the dogs out in the yard for the last time. 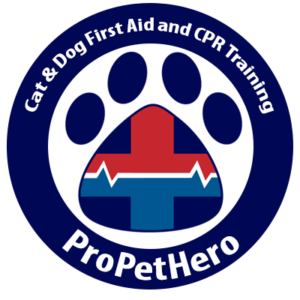 Your two Boxers dart out after something and the Weimaraner and Golden Retriever you have spending the night take off in pursuit of your pups. You hear a scuffle then you see to your horror, one of your Boxers has a skunk by the tail! You scream, he drops it but the damage is done. Your dog’s face has been blasted twice by the skunk, the second spray hitting the 2 guest dogs. thankfully your other dog misses the action but you’r left with 3 stinking dogs and one trying to rub his face off on the driveway from the noxious odor. Unfortunately the solution proven to rid of skunk smell is not stable so you have to have the ingredients ready to be assembled. I have a red bucket with gloves and the ingredients ready to go. WARNING: This mixture is chemically unstable and must be rinsed away after using. Why Can’t I Make It and Have It Stored? The solution is unstable, which means it will give off gas, until the pressure inside any container is enough to cause it to explode (which can cause serious harm). Mix ingredients together in a plastic container, metal can cause the hydrogen peroxide to break down and become less effective. You should create a paste, rub the mixture onto the sprayed victim thoroughly. Try and find the areas that got hit directly if your nose is still working. Let solution work for about 5 minutes. If your dog was sprayed in the eyes, rinse eyes with water as soon as possible. If skunk odor persists, rinse and repeat. Dispose of remaining anti-skunk mixture immediately down the drain. Note: Use baking soda, not baking powder. “Arm and Hammer” is one popular brand. Do not confuse baking soda with Washing Soda, which is Sodium Carbonate. Washing Soda is about 100 times more alkaline than Baking Soda and can cause skin burns to both you and your pet. For more information, FAQs, a detailed chemical explanation of why this solution works and more, see author and inventor Paul Krebaum’s website. Here is a quick video on how to make the mixture and apply it to your stinky pup. The popular TV show tested this out and they concluded that this solution worked best. Tomato juice and douches do not and do not waste time waiting for the groomer to open the next day. You have to get this done before it settles in and the stink stays for so much longer than you ever wanted. If you can’t clean them up outside, touch as little as possible in your home. 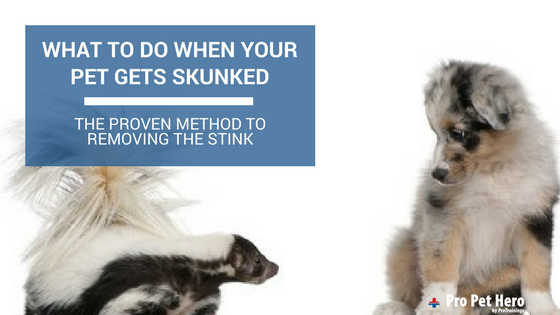 If they must be cleaned inside and after the ordeal you still smell skunk, place containers of baking soda throughout the house to absorb some of the smell. Keep the solution you make away from their eyes, it will cause irritation and do not use on their mouth. Sounds silly but my dog’s tongue smelled for months because we couldn’t effectively clean it. As for the skunk, it was fine. We found it in a corner of the yard and helped it cautiously scurry away, his defenses worked. Do check on them safely if you can. Call animal control if they are injured and need to be removed from your property and keep dogs leashed and away from the blast zone for a few days. Despite the defense mechanism working and keeping the skunk alive, dogs don’t seem to learn not to try again. Do you have a skunked story to share?